Perhaps it is time I begin to introduce the imagery. The purpose of this blog, initially, was to document the process of discovery and evolution that I am experiencing in this MFA program. It is a record, I suppose, though those of you that know me will understand why I am reluctant to call anything that exists as purely digital to be a record of anything. So let us call this a supplemental record of my work, my education, my evolution, and my flight. This is the image that started it all, though it took several months for me to realize that, and for Tim Bradley to say the remarkable phrase that would start me off on not only my project, but my purpose and my vision from this point forward. However, that story will come with that image. This story is one of self discovery. The assignment was "Take an image that can only be seen through the lens of a camera." A fellow student at the time, David Torrey de Frescheville (I hope I spelled that correctly) had done an image for our assignment titled "Save the World with a Ball of String" that so inspired me I dusted off a toy camera I had received as a gift and never used. The camera was a Holga, and it is one of my most treasured instruments now. At the time, however, I had never used a Holga and was still very much in control of my every move. I would EI test every film with every camera setup, I would meticulously calibrate my meter, my shutter speeds, my ability to handhold at how slow of a shutter for what lens. And so was my daily routine. It was, as Tim once told me, a technique that "made the photographer visible." It was something that did not bespeak my artistic side, but my scientific. I had struggled, up until this point, with the concepts of how to merge the two, and though the imagery had a certain commercial shine to it, it seemed to lack something elemental, something vital. So, with great hesitation, I ventured out on a photo shoot with an untested piece of toy equipment that had very little chance of being successful. I couldn't, however, give up every sense of control. I wanted to take a test roll, which I would develop first and see how the film responded to the Holga. Once I understood that, I felt that I would be able to manipulate the final roll of film to be what I needed it to be in processing, feeling certain that I wouldn't get it in camera. But I braved the new territory anyway. There was something about using film again, something about not knowing the outcome, that led me, without reluctance, back to something of my past that had, for some time, been defining me. I was aware of it. I knew that I had been swayed by the raven the moment I first encountered the raven of my grandfather, even got a tattoo of a raven on my back, but something occurred to me that I hadn't really thought of before. I have never taken a picture of a raven with intention. I have a shot of a raven; a massive, carnal looking creature; standing on the wall of the Tower of London. He was very close and looking right at me, so I took the shot. It is remarkable only in the size of the raven. That is the only shot I have ever taken of this obsession of mine, of this fetish of necessity. 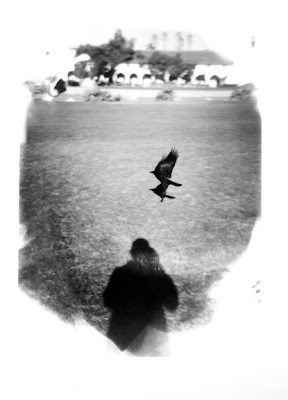 So, with my fresh roll of Tmax 100 loaded into my Holga, I set out to photograph a raven or two in preparation for my "real" shoot. I remembered having seen several ravens at the rose garden beside the Santa Barbara Mission. I headed down, thinking more about what sorts of shots I would get for the assignment than about the birds. When I arrived, there were three or four circling and gliding around the area, occassionally landing to peck at the ground for bugs. I saw one in particular land nearby on the opposite side of the roses. I don't think he saw me. I crouched down, camera in hand, and silently crept towards him. We rounded the corner at the same time. He looked alarmed, but jumped back only slightly. He took a couple more hops away and I moved in, set the Holga to the picture of the group of people for focus (rather then just the head, as it had been positioned on) and took a shot. He watched me, hopped around for a second, and turned the other direction. I shot again. This time he took off and I snapped again, following him with the camera as he slowly circled me in the air, furiously winding the manual reel to the next exposure, madly snapping and winding until he had encircled me in one fluid motion and flapped away and out of sight. When I developed the film I almost cried. 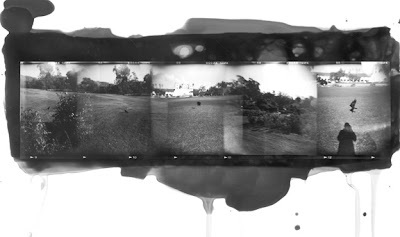 Due to confusion about the settings of the Holga I had overlapped the images, creating a new landscape, and a story. The bird starts out, turns, flies away, and returns. That is what happened when I took the images. But the outcome was the bird starting, turning, flying, me flying, and then the bird and I sharing a moment, sharing shadow land, sharing flight. It became the landscape of my life story. This is the most important image in my life. This sums it all up. It is following the passion that started me out, turned me around, gave me wings, let me see from another perspective, and allowed me to coexist with the mythology that has created me. It is titled Self Portrait V because there are five ravens in it. The four that everyone can see, and the one that I can now see. The rhyme is in relation to an old superstition about being able to "count crows" to determine the future. Five for silver has particular importance to me because of the diminishing art of alchemic photography. The reason this starts it all is that it got me back into the darkroom, back into film, back into my own self discovery. If ever historians look back at me and don't recognize this as a turning point, then you, who are educated and wise, can laugh at their ignorance and knowingly recite the truth.